Fourth Row Center: Film Writings by Jason Bailey: In Theaters: "Puss in Boots"
The outlaw-swashbuckler-Zorro vibe is pushed pretty hard in Puss in Boots, along with the shadow of Banderas’s Robert Rodriguez-helmed “Mariachi” movies; not only does an early barroom scene recall his introductions in those earlier pictures, but leading lady Salma Hayek has been brought on to play his romantic interest, “Kitty Softpaws.” (These two spark so good, they’ve even got chemistry as animated cats.) She is involved in a plot devised by Puss’s old childhood friend Humpty Dumpty (Zach Galifiankis) to steal the fabled magic beans from Jack (Billy Bob Thornton) and Jill (Amy Sedaris), climb the beanstalk, and steal the golden goose at its top. The fairy-tales-on-shuffle approach is familiar from the Shrek pictures, though the reimagining of Jack and Jill as hillbilly heathens doesn’t really work (even if Sedaris and Thornton amuse). What has thankfully been curbed is the series’ reliance on explicit, instantly-dated pop culture jokes; those that do make the cut (like a Fight Club/”bean club” bit) land with a thud. The trouble is, there’s precious little humor to take their place. A few running jokes barely get a titter; it’s somewhat surprising, and probably a bit of a financial waste (since they presumably paid him a few bucks), that they hired Galifianakis and didn’t remember to write any jokes for him. As usual, Banderas spices things up with his witty vocals, and he gets another good catnip/pot joke (of the small supply he keeps with him: “It’s for my glaucoma”). But for the new incarnation of a series that began firmly comedic, they’re taking an awful lot of this silliness seriously. What Puss in Boots seems more interested (and more successful) in being is a Saturday matinee adventure yarn. Director Chris Miller hustles from one action set piece to the next without stopping in between to catch his breath—or to work in much in the way of warmth or humor. But those action beats play; they’re well crafted and frequently exciting. A stagecoach chase is a real barn-burner, the beanstalk sequences are impressive, and the big climax is satisfying. And it must be said: the 3-D effects are pretty good. It’s present without being overdone, making ingenious use of foreground and background, and lending some spice to the clever split-screens (which use the extra dimension for spillover). 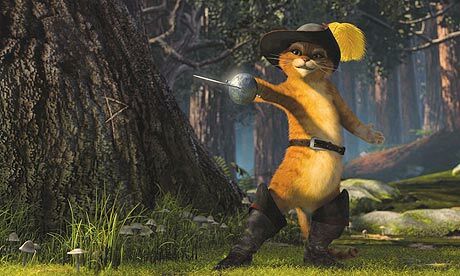 Puss in Boots is not a great family film; it’s too scattershot, too lumpy, and the jokes just aren’t funny. But it is entertaining, aiming squarely at achieving the kind of roller coaster fun found in How to Train Your Dragon or your better Pirates of the Caribbean movies. It’s a good enough time, and that’s more than could be said for those last couple of Shrek pictures. "Puss in Boots" opens Friday in wide release.